Posted December 7, 2016 by Green Dog & filed under Amazing Things You're Not Buying, Cancer, Cat nutrition, diet and health, Dog Nutrition, other health concerns, pet food ingredients, Products We Love, Whole Food Toppers. We try to carry the best dry foods on the market, but it’s important to realize that even the best ones are still heavily processed food. Some ingredients are put through multiple layers of processing, and the whole batch is baked or most often extruded, which is a high heat, high pressure process that can damage nutrients, enzymes, and valuable amino acids that have important jobs to do in the body. Most pet owners find one kibble that works and just stick with it, but this really limits the number of nutrients available to your pet. 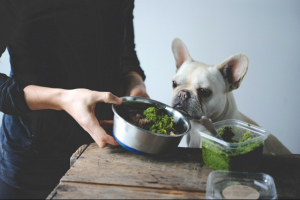 Some pet food companies say you should never ever switch your dog’s food, but that doesn’t make much sense (they just don’t want you to feed someone else’s food!). Why should you sometimes switch your pet’s food? No matter what, even the best brands of kibble are highly processed foods that lack whole food nutrients and enzymes that can help their bodies thrive. Topping off their kibble diets with a little whole food can make a huge difference for their health! Even the nicest raw food diets can be lacking nutrient diversity – no matter how thoughtful and knowledgeable we are, we couldn’t make a single meal for ourselves that we could eat every single day of our lives and not have a deficiency or excess of something for our individual nutritional needs. We can certainly say the same for our pets! Variety over time creates nutritional balance. Adding whole food toppers are a great way to help to round out their meals, especially if you rotate through different ones! Just like for people, a diet for pets made entirely of processed foods with no fresh whole food nutrients is a recipe for chronic illness. 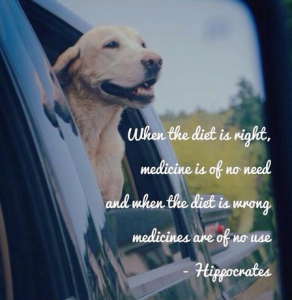 With the rapid rise in chronic illnesses like cancer, we should (in our opinion) be doing everything we can to boost the diets of our precious, short lived pets to try to take advantage of whole food nutrients. But what to give? This is where whole food toppers come in handy. Most kibbles rely heavily on synthetic vitamins and minerals to make sure that valuable nutrients that are damaged by cooking are not missing. However, whole foods have valuable qualities that trump any single synthetic vitamin. For example, a carrot has valuable Vitamin A, but to quote http://www.whfoods.com, “carrots actually contain a fascinating combination of phytonutrients like betacarotene and other carotenoids (especially alpha-carotene and lutein); hydroxycinnamic acids (including caffeic, coumaric, ferulic); anthocyanins (in the case of purple and red carrots); and polyacetylenes (especially falcarinol and falcarindiol). Carrots are an excellent source of vitamin A (in the form of carotenoids). In addition, they are a very good source of biotin, vitamin K, dietary fiber, molybdenum, potassium, vitamin B6 and vitamin C. They are a good source of manganese, niacin, vitamin B1, panthothenic acid, phosphorus, folate, copper, vitamin E and vitamin B2”. WOW! Just trying to isolate single vitamins makes you miss out on the incredible complexity of nutrients that were designed to work together. So, we don’t recommend getting a supplement made from synthetic vitamins, we recommend rotating through a variety of Whole food toppers one at a time to help to cover all of their nutritional bases. We’ve decided to create a tag called “Whole Food Toppers”, and to add a series of articles about our favorite whole food toppers for pets. Some will be things you can make or just add from your own fridge, and some will be our favorite ready-made commercially available toppers that you can look for at your favorite local pet supply store. Most will be for dogs, but we’ll point out what would be appropriate for cats of course. The most awesome thing would of course to switch entirely to a fresh, minimally processed diet. Over and over we see chronic illnesses and conditions solved by doing this. However, many people are not able to do this for themselves, let alone their pets. There’s a lot to be said for the convenience and price effectiveness of kibble. But as I always say, whole foods don’t have to be an all or nothing proposition. Any amount of whole foods in our own diet is a good thing, and the same goes for our pets. – Introduce all new things slowly. Start very small and build up to the suggested serving size. It’s a good rule of thumb for all foods and supplements. What if your pet had an allergy you didn’t know about and you heaped on something new? You can’t “un-give” it if they’ve started to show a reaction to it. What if your pet’s digestion is affected by something new? No one likes a blowout. – Always try one new thing at a time, so you can see whether it does or doesn’t agree with your pets. – Watch your portions. If more than 20% of their meals are something you’re adding, you may need to consider if your meal is balanced. Variety does help to create balance over time, but regularly adding even a little whole food to your kibble will create benefits. Sprinkle stuff on. If you normally add a few spoonfuls of canned food for variety and flavor, that’s great. Maybe try to introduce other things in the same amount to your dog’s kibble. Added perk: they’ll almost always be less expensive than canned foods. Here’s a great product that we love. 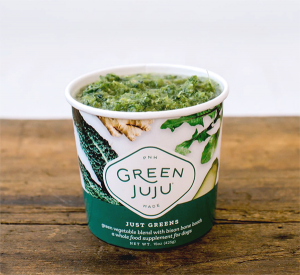 Original Green Juju™ is a whole foods supplement fed to dogs in addition to their kibble, raw, or home cooked meal. Carefully crafted in the Pacific Northwest, it contains certified organic, locally grown ingredients that provide essential nutrients to support canine immune systems, target specific processes and contribute to optimal health. Carefully crafted in the Pacific NW, it contains certified organic, locally grown ingredients that provide essential nutrients to support canine immune systems, target specific ailments and contribute to optimal health. 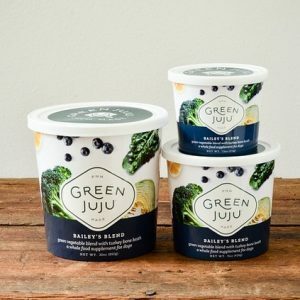 Green Juju headquarters are nestled in the Seattle neighborhood of Ballard, where the team works hard daily to help dog owners contribute to the optimal health of their pups. Owner Kelley Marian has been a pioneer in raw greens supplements and was the first to market with her original greens blend. They’ve just come out with a 2nd formula, “Bailey’s Blend”. This is an excellent choice for picky dogs, as it’s a little bit milder tasting, and could be good for dogs who have never tried greens before. These are all low glycemic ingredients that provide unique benefits and variety, including support for joints and bone health, providing antioxidants, while also fighting inflammation. Make sure to rotate between them for maximum nutrient diversity!